UPDATED Monday 9:30 a.m. – see indented paragraphs. 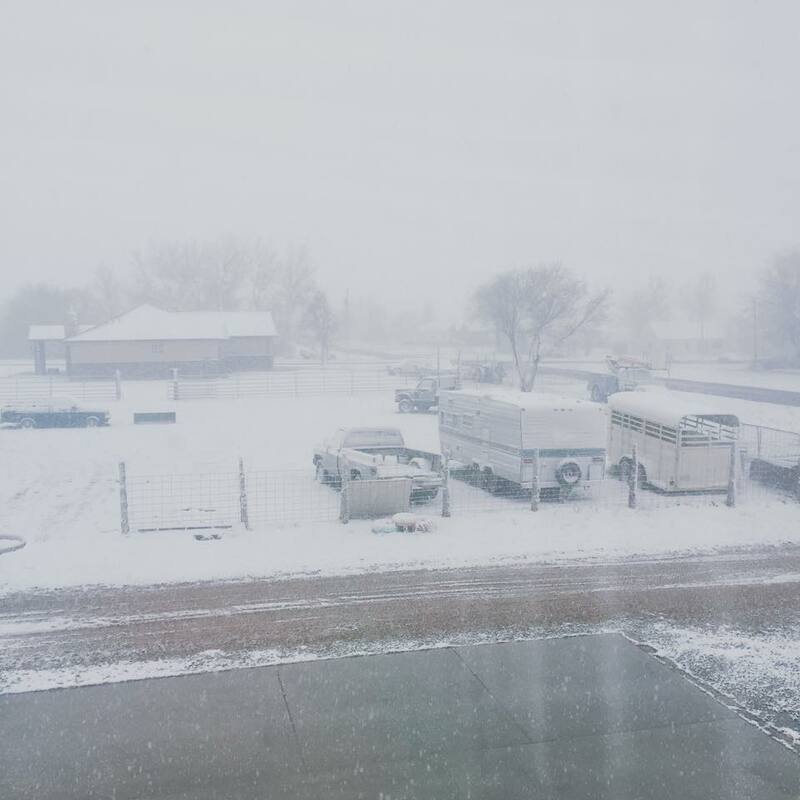 ST. GEORGE – The National Weather Service has issued a seven-day hazardous weather outlook for Saturday through Friday affecting the western two-thirds of Utah and southwest Wyoming. 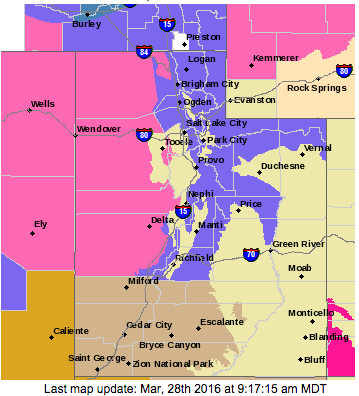 The service’s high wind watch for parts of Southern Nevada remains in effect and could impact Southern Utah as well. Multiple crashes on Interstate 15 in the Beaver area Saturday morning have resulted in closure of southbound Interstate 15 at mileposts 117 and 94, according to Utah Department of Transportation Saturday morning. One northbound lane is moving as of 8:45 a.m. Expect major delays in the area until around 11:45 a.m. White-out snow conditions have been reported in that area. Holiday traffic through the Virgin River Gorge on I-15 has been ebbing and flowing throughout the weekend and delays can be expected. Highway 91 is an alternate route that bypasses the Gorge entirely, intersecting with I-15 at Exit 8 in Littlefield, Arizona, to the south and connecting to St. George at the north via Santa Clara and Sunset Boulevard. Throughout the day and night a weather disturbance moving southeast through central and Southern Utah will generate areas of light to moderate snow early Saturday morning. Accumulations of snow up to 2 inches are possible. Temperatures Saturday will generally fall below late March normals across the entire outlook area. 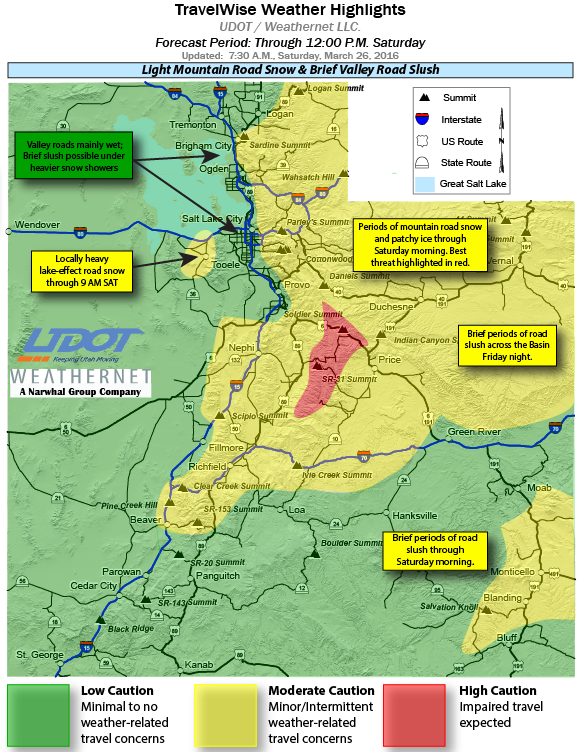 Southern Clark County, Nevada, and Southern Utah: A quick moving upper low in the process of traversing eastern portions of the Intermountain West will yield hazardous winds in the Colorado River Valley Saturday. Sunday through Friday high pressure aloft over Utah early Sunday will move east away from the outlook area during the day. Western Utah: Warmer temperatures and breezy south winds will develop during the afternoon, especially across the western portions of Utah. A slow moving cold and wet storm system will enter the great basin early Monday then remain over the region through midweek. Monday update: According to an updated outlook release from the Weather Service, the cold spring storm centered over Nevada will enter western Utah on Tuesday. 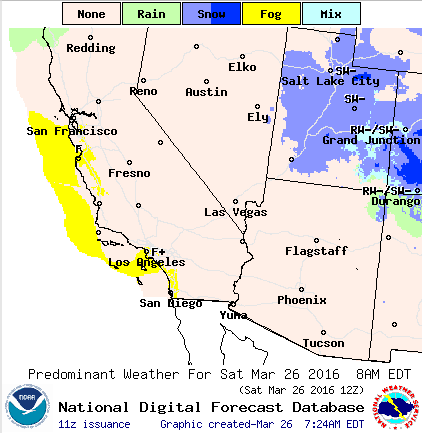 Widespread mountain snow will exist with heavy snow likely for the northern and central mountains into Wednesday. Valley locations across western and northern Utah will receive significant amounts of snow or snow mixed with rain through early Wednesday. Heavy snows are possible across far western Utah from this storm. Southern Clark County, Nevada, and Southern Utah: The winds that began Saturday will be followed by a more potent upper low that will dive southward into the region Monday and Tuesday, yielding high winds across the Mojave Desert and portions of the Great Basin. West to southwest winds 30-40 mph with gusts 50-60 mph are forecast for Monday afternoon, peaking in the evening and decreasing late Monday night. The Spring Mountains in Nevada could see gusts exceeding 70 mph. Northwest Utah: The associated cold front is forecast to reach northwest Utah late Sunday night. Ahead of the front, gusty south winds and warm temperatures will exist. Showers and isolated thunderstorms will form along and behind the cold front late Sunday night through Monday morning. Statewide: Precipitation will become more widespread as the storm system settles over Utah during the afternoon and nighttime hours Monday. Monday update: According to a Monday outlook issued by the Weather Service, precipitation will become a rain-snow mix across most of northern and western valleys Monday afternoon through the evening. The heaviest precipitation will remain across far western Utah and through the northern mountains. Isolated thunderstorms may also develop across southwest and central Utah late this afternoon through early this evening. Cold and unsettled conditions will continue through early Wednesday. Temperatures will be cold enough for snow at all but the lowest elevations by Tuesday. Significant snow accumulations are expected from this storm in the mountains as well as many of the higher valley locations. Moving east: The storm system will finally move east away from the outlook area on Wednesday. Lingering snow showers will exist through early Wednesday evening. High pressure advancing east into the great basin late in the week will bring dry conditions and a warming trend to the outlook area. Motorists in the high wind advisory areas should be prepared for sudden gusty crosswinds and poor visibility in blowing dust and sand that can make driving difficult. Temporary structures may be damaged or destroyed. Trees and power lines may be blown down. For route-specific information on Utah’s roads and highways click here.